Formerly known as Swiss Hotel (run by Help Tourism group), this property has been recently taken over by the Summit Group, undergone renovations and complete refurbishment of rooms and has been converted to a 3-star hotel from a 2-star property. This heritage property was originally built in 1914 when it was owned by a Swiss couple. The property was then used as a bakery. Gradually the couple transformed it into a small inn providing a few rooms. It was then known as 'Swiss Inn'. Over the years the property has gone through several changes in ownership and transformations. However the old colonial architecture has been retained over the years. 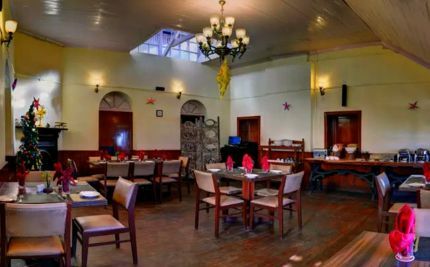 The hotel is located on Gandhi road which is one of the main thoroughfares in Darjeeling. From the main road you will need to step down a short flight of stairs and through an arch gate to reach up to the reception door. The hotel is actually located on a land below the road level. The reception area is quite small. 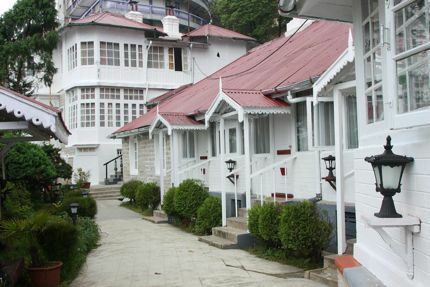 The hotel has 8 spacious rooms in a two storied main building plus 4 cottages lining a lush lawn. There are four heritage rooms in the ground floor of the main building and 4 in the upper floor. You will notice that rooms in this building are named after flowers such as Magnolia, Azalea etc. Earlier these rooms were named after famous mountaineers like Tenzing Norgay, Nawang Gombu, Jamling Norgay, Dorji Latu and so on. The rooms are all large and well furnished. All rooms have free wi-fi, LCD TV with standard satellite channels, fireplace, queen bed (with bed warmers... very useful in cold nights), a small seating area usually near the windows with cushioned chairs and tables, a cupboard, and a dressing table with a mirror... the whole ambience reflects the old colonial charm. 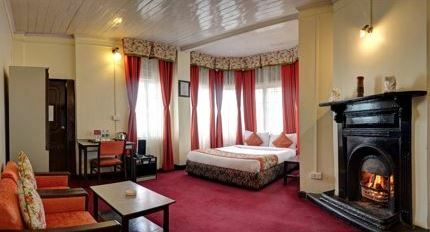 The rooms are clean and maintained well as you would expect from a Summit group hotel. The staff provide iron on request. The rooms have intercom. The western style bathrooms are well done up. They have geysers and shower mixers for hot and cold water. Some rooms upstairs have great views through the large bay windows that open outwards. On a clear day you can see the entire Eastern Himalayan range including the snow peaks of Kanchenjunga. From the window of my room I could see the field of Nepali Girls High School below and the children on their uniform playing on the field. You can clearly see the Chowk Bazar area from here and the roof of the Dhirdham Temple near Darjeeling Railway Station. As you come out of the main building towards the lawn, right ahead is the dining room or the restaurant known as 'The Whistling Steam'. This restaurant was originally set up in 1941 and retains the same architecture today. It serves multi cuisine dishes. The food served is nice but breakfast is the same daily. The dining hall has several glass topped wooden tables with cushioned wooden chairs. With wood finished floor and wooden furnishing, the dining room has a classy elegant touch. There are four cottages lined up on one side of the lawn. The cottages have a sitting area in front (more like a covered balcony with windows), a large bedroom with a fireplace, wooden floor, queen size bed, cupboards and dressing table with mirror. Bathrooms in the cottages have geysers with shower mixers. Two out of the four cottages here are larger and have two king size beds, and these are ideal for families of four. The lawn here is the highlight of the property. If you want to enjoy the scenic beauty of the hills from a quiet place, sit on a swing or a chair in the lawn and absorb the surroundings. This is a great place to have a cup of Darjeeling tea and soak in the views around. At the end of the lawn, there is a large car park which is part of the property. So if you are driving down, there is ample parking space here. The hotel gives you a great opportunity to stay in a well furnished heritage property. The rooms and the property are maintained well. The dining hall has a nice ambience and serves nice multi-cuisine food. The hotel is located about 12-15 minutes walk from the Chowrasta Mall. Considering a hill town, this walk may be a little cumbersome for some. However the stretch of Gandhi road here is quite flat. There are plenty of shops and restaurants within walking distance. There are only 12 units (8 rooms & 4 cottages) in the property and I have noticed that even during low season the Summit Swiss Heritage Hotel has high occupancy rates. So you will need to book in advance. It's a great property to stay with families. It has a lawn with swings. Rooms are spacious. I think I can get a reservation at Swiss Hotel. Do you know whether there is traffic noise inside the rooms there, especially in the cottages? What dates are considered high season? I will be there in early November. I've been trying to book with Swiss Hotel. At first they said no rooms are available, but with persistence I discovered this is not true. Are the cottages all detached from one another? I saw a photo but I don't know whether this is of the back of the main lodge, or of cottages that are attached to one another. In my mind, cottages are separated, but who knows? I think the cottages would be less noisy if they are separate. I appreciate your advice. Swiss Hotel has its own car park next to the lawn and taxis can drop you right there. It would be comparatively less noisy. But the cons is that it's quite a walk from there to the Mall (Town Center), shops and restaurants. Early November is high season and Darjeeling is likely to be packed. Cottages in Swiss Hotel are attached. The rooms in the upper floor of the main building (view rooms) are better in my opinion and well equipped.